With the daily cameras becoming more and more powerful, it is no surprise that video processing has become so important. 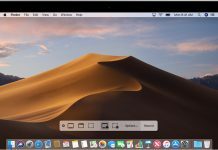 There are a plethora of video processing softwares available in the market, but finding the one that can handle 4K videos, along with other large video files is a rarity. In comes VideoProc, one of the most powerful video processing tools that I have came accross. I would not claim all of this had the software not proved itself. However, VideoProc comes with level 3 hardware acceleration; Nvidia and AMD GPUs power the acceleration itself. 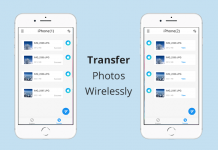 The purpose of having this level 3 acceleration is to ensure that the editing, and transcoding 4K video files become a simple task, and there is not a loss of quality. Even if you don’t use 4K files, you can easily use this software for files that are not in 4K, and you would still have a great experience. If you are someone who shoots 4K videos with their GoPro, I can assure you that you are going to love this software. You do not need to use overly difficult, or resource heavy programs to easily process and edit your 4K videos. As a part of our VideoProc Review, we are also going to take a look at the tutorial about converting the 4K videos before we move onto the features, and the verdict itself. Many people I know have complained about how processing videos at 4K is an absolute pain because the programs they are using are either too resource heavy, or the whole method is very complex. The good thing about VideoProc, however, is that neither the process is complicated, nor the software is way too heavy on the resources. If you have a modern day computer with multi-core CPU, and a moderately powerful GPU along with it, your experience with using VideoProc would not be affected. As a matter of fact, you can check out our guide below to see just how easy it is to Process 4K videos using the VideoProc. If you are looking to cut, trim, edit, or even stabilize GoPro 4K video, then this software is. Step 1: The first step that you need to take is to install the software. The process is fairly simple and straightforward, so you do not need to worry about it. Step 2: Once the software is installed, simply go ahead and launch it. Step 3: When the software launches, you will be brought to the screen you can see below. Step 4: You have options such as Video, DVD, Downloader, and Recorder. Step 5: Next up, you will need to setup Hardware Acceleration that can be done by clicking on Settings > Options > Hardware Acceleration. 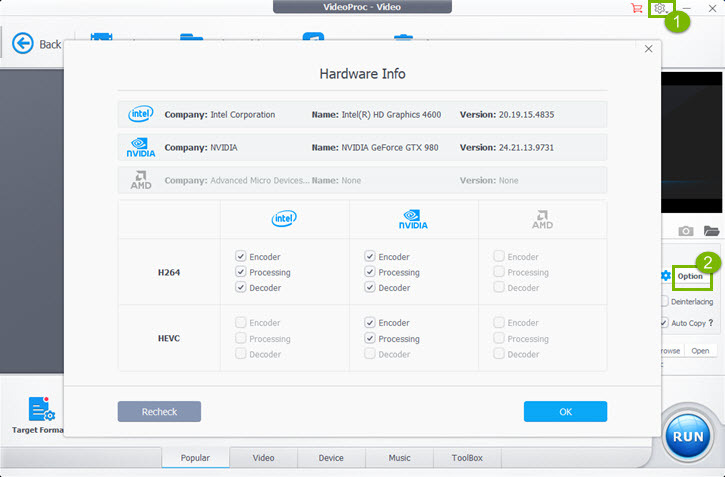 Then go to VideoProc – Video > Option that you can find right next to Hardware Acceleration Engine. Step 6: Once that has been done, you can click on Video+ button in order to import a single, or multiple videos for editing. Step 6: There you will see options such as crop, cut, watermark, effect rotate, and subtitle. You can choose any option you want based on your requirement, and you will be taken to a new screen. Step 7: Since we are talking about editing Go Pro videos, simply click on the Toolbox tab that you can find on the bottom right side of the interface, and click on Deshake from that point. Step 8: Simply move the green cursors to trim the shaky part of the video. Step 9: Now you can move the slides on the right side to adjust the shakiness of the part you selected. Under the same box, you can find options to denoise, fix fisheye, along with a heap of other options. For a GoPro user, these options are great, and should serve you well without any issue whatsoever. As talked about before, the VideoProc does support Level-3 hardware acceleration. There is a heap of benefits you get from using the software. Thanks to GPU hardware acceleration, the video processing increases by up to 47 times. I know the numbers clearly sound crazy but that is true, and tested. Considering how hardware acceleration makes use of both your CPU, and GPU to increase the speed of video processing. While 4K videos are a lot of fun to shoot, one thing that you must keep in mind is that they take up a lot of space. The good thing about VideoProc is that you can reduce the file size drastically without having to worry about. The best thing is that you will not have to compromise on the quality either. Many video processing programs that I have used in the past had one of the biggest issue, and that was that they took the CPU usage to the maximum. However, the same situation is not the case with VideoProc. Thanks to the efficient working of level-3 hardware acceleration, the entire workload is evenly distributed between both your CPU, and GPU in order to give you the best possible results. 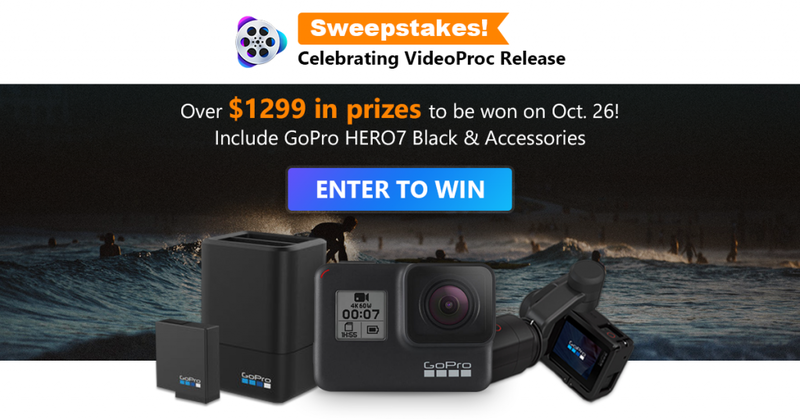 In order to celebrate the new release of VideoProc, they are hosting a sweepstake, where you have a chance to win a GoPro Hero 7 or accessories. The winners will be announced on 26th October, later this year through a random draw. As part of the celebration, everyone can get a VideoProc license for free. How to join? Step 1: Go to the sweepstake by clicking the above button. Step 2: Simply enter your name, along with valid email address to enter into the sweepstakes. Step 3: Once you have entered the details, you will need to click on “Count me in”, to finalize it. If you want more entries, you can share the event across the social media, raising your chances of winning. Tip: You can also get a free license key of VideoProc (Windows/Mac) by clicking the “Free Download” button in the sweepstake page. 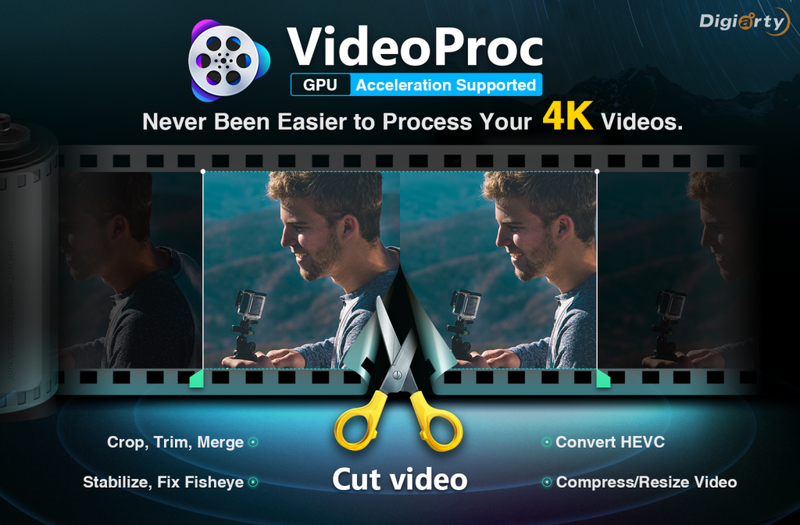 Aside from amazing ability to edit and process 4K videos shot by GoPro, or other cameras, there is a good amount of features available in VideoProc. In order to make things easier for you, we are mentioning some of the features below, so you have a better understanding. 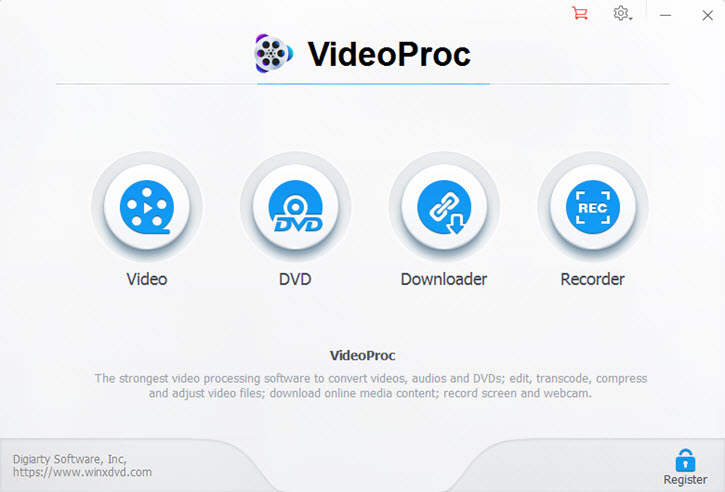 If you happen to have a DVD and you want to convert the contents of that DVD so you can use them digitally, then VideoProc is a great tool that will help you achieve that without any issue whatsoever. The process is simple and does not take much time either. However, I would suggest that you take into the account factors such as the condition of the DVD itself, and additionally, the size of the files. Another feature that a lot of people would love about the VideoProc is that you can record your screen with great ease. For those of you who prefer recording tutorials, or gameplay videos. Then this feature is going to be extremely useful for you. I use my phone and my GoPro Hero7 to shoot some amazing 4K videos all the time, and despite having a moderately powerful computer, I do run into video processing issues for one reason or another. I have used almost every famous solution I can think of, and the result is the same across the board. However, with VideoProc, things are much better, and simpler. I no longer have to worry about slow processing, or other issues such as a slowed down the computer or a CPU that is carrying all the load. 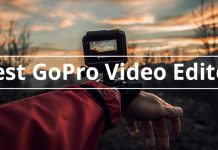 Not just the video processing, nearly every feature about VideoProc is amazing, and I couldn’t have found a better video processing software for GoPro videos that I shoot on a regular basis. Outside of the amazing video editing software, all the other features are extremely well made, and well rounded. You will not run into any issues using those features either. Level-3 hardware acceleration is the real deal. Work on the majority of configurations. Loaded with amazing features that are great for editing videos. Can download music, as well as videos.